FAMILY ISN’T JUST AN IMPORTANT THING. real estate team, they’re here for you every step of the way…just like family. Lisa is a true professional full-time Realtor focused exclusively on North Scottsdale. Her hard work and dedication has resulted in broad recognition of her abilities and accomplishments. Click to hear what past clients have to say. People often tease Lisa Lucky that her last name has a lot to do with her success. The truth is that luck has had very little to do with it … but hard work, honesty and integrity certainly have. Lisa takes none of the success she has achieved for granted. "I have worked very hard from 'day one' and feel very blessed that The Luckys are at the top of our company. Lisa, a resident of the North Scottsdale community of Troon Village, began her real estate career in 1999 at Pinnacle Peak Realty, which was later bought out by Coldwell Banker. In 2003, she earned her Associate Broker's license and later that same year, moved to Russ Lyon Realty, now Russ Lyon Sotheby's International Realty. Lisa graduated from Vanderbilt University then worked in sales and franchise marketing. She also managed her father's Plastic Surgery practice for 10 years. All of these professional experiences have served me well in understanding complex financial transactions as well as the importance of actively listening to and communicating with my clients. She adds that her father always taught her to do what's in the best interest of her clients. Dad said take care of your clients and things will always work out for the best. I use his advice every. The Luckys have a Proven Track Record. Lisa was recognized as the top producing Russ Lyon Sotheby's International Realty agent in 2015. That's a significant achievement considering Russ Lyon Sotheby's International Realty has over 1,000 agents, and the largest market share by far in North Scottsdale. Latest market share information. So what's the bottom line for this Lucky lady? I love the fact that we're surrounded by other successful agents, because it pushes me to be even better. Matt and I believe that failure is just not an option; we always do what we say we're going to do and we never, never, never give up! With the analytical mind of an engineer combined with the focused desire for working with people, Matt Lucky is one of those rare individuals that bring a unique and specialized aspect to the business of real estate. 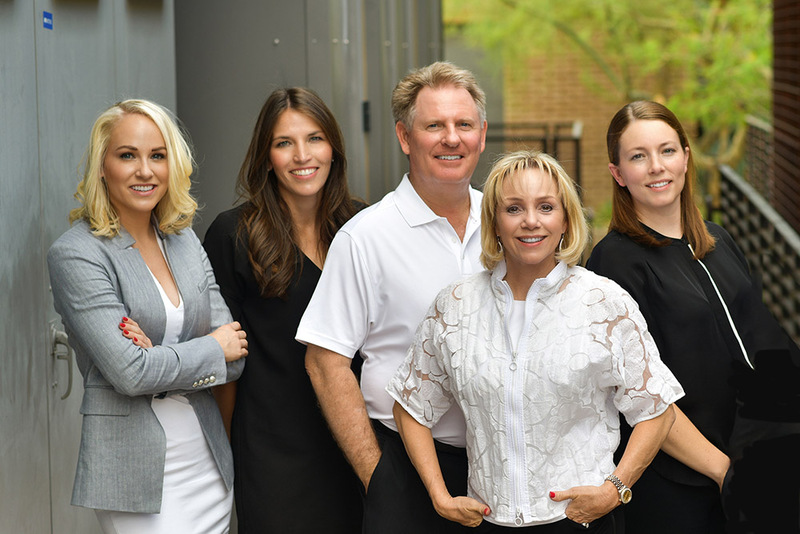 Along with his wife Lisa, and daughter Laura, The Luckys are proud to offer their clients the "power of three," each with their distinct strengths and expertise. "I have a visual, 3-D mind," says Matt,"that allows me a great recollection about properties and inventory in our community." In the focused area of North Scottsdale that The Luckys represent, he's either sold or seen nearly every single property, which offers a great advantage to his clients. However, for Matt, meeting and working with people is what brings him true joy in his career. "I relish each new opportunity that a new client brings," he says, "because listening to their needs and setting upon the 'project' of exceeding their expectations is my favorite part of each day." Perhaps Matt's excellent people skills came from a diverse cultural background growing up. Born in Houston and raised, in part, in Massachusetts and Santa Barbara, Matt's family periodically lived abroad including residency in both France and Scotland. Matt, who earned his undergraduate degree in Mechanical Engineering at Tulane University in New Orleans and his MBA from Rollins College in Winter Park, Florida, began on a drafting board for a major engineering construction company. Realizing a knack for computers, Matt worked for a contractor developing complex systems for the military, FAA, and FBI. "I've worked on a multitude of intriguing projects such as the military's Longbow helicopter." It was Honeywell that brought Matt and Lisa's family to Arizona in the late 1990s, where Lisa began a thriving career in real estate. The decision to partner full-time with Lisa came in 2005, and by 2006, Lisa earned the Top 1% status at Russ Lyon which she's attained every year since. Matt brings his detail-oriented and analytical thinking to the team and focuses on consistency, quality and always staying ahead of their competition. In 2012, Matt and Lisa's daughter Laura joined the thriving team, creating a true powerhouse unmatched in The Valley. As an avid hiker and golfer, Matt has found his leisure time pleasantly spent trekking though McDowell Sonoran Preserve trails, with a personal goal to traverse each and every trail in the system. And while golf is a common draw for visitors and residents alike, Matt has the pleasure of golfing North Scottsdale's premier courses on a regular basis and is sure to offer 'insider perspective' on each! Matt has been a McDowell Sonoran Preserve steward, served on the board of The Friends of Pinnacle Peak Park (FOPPP), and started the FOPPP newsletter, served a editor for 7 years. Loving where you live, and living what you love is a secret to good business. It seems Matt has found his way to do just that. "It's a blessing to work in an industry that I love while being surrounded by the people I love the most," says Matt. Who could disagree? While real estate is in her blood, her passion for helping others is truly what drives Laura Lucky’s success. Having earned her Arizona Real Estate License at just 18 years old, Laura knew at a young age that joining her parents, Matt and Lisa Lucky, in the family real estate business was not simply her path of choice, but somewhat of a calling. Realizing that her appreciation of Scottsdale combined with her desire to be of service could lead to a satisfying profession, she set out to create her real estate career. “I’m privileged to work with my parents who have exceptional experience, knowledge, and expertise in the North Scottsdale community. As a tight-knit family jointly focused on our goals, the three of us are quite a force in local real estate!” Laura says with a brilliant smile. Shortly after obtaining her real estate license, Laura graduated from Arizona State University with a Bachelor of Science degree in Marketing and International Business. Laura’s proficiency in marketing has become a hallmark of The Lucky Team and continues to help drive The Luckys to higher degrees of success. In addition to her aptitude for brand management and promotion, her training in international business presents her with a distinct vision and provides opportunities to aid real estate clients from all over the globe. In 2013, Laura acquired her Broker License and is now an Associate Broker at Russ Lyon | Sotheby’s International Realty. In 2015, Laura was singled out as the “Emerging Realtor of the Year” and has been recognized as a “Top 40 Under 40” for the last four years by the Scottsdale Area Association of Realtors. Both living and working in North Scottsdale, Laura has close ties to her community and the Valley as a whole. In addition to helping her real estate clients, Laura takes great satisfaction in actively advocating for several local organizations. Some of her happiest life moments have come from the hours devoted to these causes. It has truly been a win-win. Her passion for helping animals has cultivated her interest and devotion as a volunteer and past board member for Foothills Animal Rescue. Not only does she work to organize their Pins for Paws fundraising event, Laura has committed to taking her service to the next level by opening her home to foster homeless animals until they find their forever families. Laura enjoys serving her church family by assisting in the nursery every week at Christ Church of the Valley. Most recently, Laura has become involved with the STARS Institute which raises funds for children with Sensory Processing Disorder (SPD) and serves as a committee member for their annual Starry Starry Night Gala. So, what spurs this energetic and dynamic woman in her non-working hours? You may find Laura working through a much-loved yoga, hot barre or pilates class at the North Scottsdale TruFusion fitness facility. As a self-proclaimed social butterfly, Laura loves meeting friends and clients over a bottle of cabernet at Troon Country Club or mingling at the dog park with her little pooch Charlie, a proud recent graduate of rattlesnake training school! Perhaps it’s precisely that joie de vivre that keeps Laura enthusiastic, confident, determined and positive in just about every aspect of her life. One thing about Laura is never in doubt: she is always ready for a challenge!